Am I a bad Muslim? Am I a bad Muslim? This is a question I frequently ask myself when I realize that I don’t finish all my fasts as part of Ramadan. I’m not afraid to go out on a short skirt if I feel confident. I don’t pray five times a day. Most of all, my girlfriend and I don’t exactly align with the Adam-and-Eve origin story in most Abrahamic faiths. Still, I’ve been able to practice religion on my own terms. I pray to God for peace when I’m anxious, and I pray for the safety of myself and loved ones when I walk home at night. My Muslim identity is not at odds with other parts of me. It just means that I’m changing the way that I think about Islam in current contexts. The further I’ve explored my religion, the more I’ve realized that my religious identity can coexist with other parts of me. For a long time, it was hard for me to come out because I had never met a gay Pakistani woman, much less someone who didn’t lose their family in the process of living and loving authentically. A few years after coming out, my mother came to me and said, “It’s OK if you’re gay. God made you that way.” It was a beautiful marriage of my religion and queerness and a reminder that I could be seen for every identity at once rather than segmenting them into different boxes. In the same way, I recognize that Islam will always be an integral part of my identity. I don’t want to eat pork, stop praying for the safety of my friends and family before I sleep, and stop having the utmost patience for others just like Prophet Mohammed. Still, I know that I’ll slip sometimes too. There may be times where I’ll talk back to elders if I feel like I’m being disrespected, and I don’t want to feel shame for the clothes I wear if it’s not considered “modest.” I’ve learned that just because I haven’t seen Muslims in their twenties who live the same life in Seattle and dream of working at Spotify doesn’t mean that my way of being is any less Muslim than others. I think part of the reason I question my own morality if it isn’t tied to strict religious practices is quite simple – I rarely see films that center on the experience of someone who is Muslim and lives a regular life. If this kind of media existed, it could encourage and normalize conversations about Islam and encourage people to begin breaking down their stereotypes and biases. I think that’s why so much of my work has focused on creating opportunities for students to see themselves reflected in the stories I write for The Daily of the University of Washington, the Center for Neurotechnology, and Microsoft. I chose to work as the diversity beat reporter for The Daily because I knew that so many of our staff are white, so our writing doesn’t reflect the stories of undocumented students, students from educationally underserved communities, and people of color in the LGBTQIA+ community. Now, I get to interview people of color who create change in their community but are also committed to “lifting while they climb” and empowering the next generation. I remember that first time I felt like I really saw myself represented in the media. My mentor sent me a story titled, “Activist Urooj Arshad Wrote A Valentine’s Day Love Letter To Her Young, Queer, Muslim, Immigrant Self.” Her letter was a mirror to the moments when my queerness had been at odds with my other identities, but also the incredible joy that comes with finding a community of people who will fight with you to create a just world. Her work makes me excited for the world that my future children could inhabit, one that is even more inclusive and validating than the one I knew growing up. So, am I a bad Muslim? I don’t think so – I’m just not a conventional one. And I’m proud that I get to be the most authentic version of me, queerness and all. 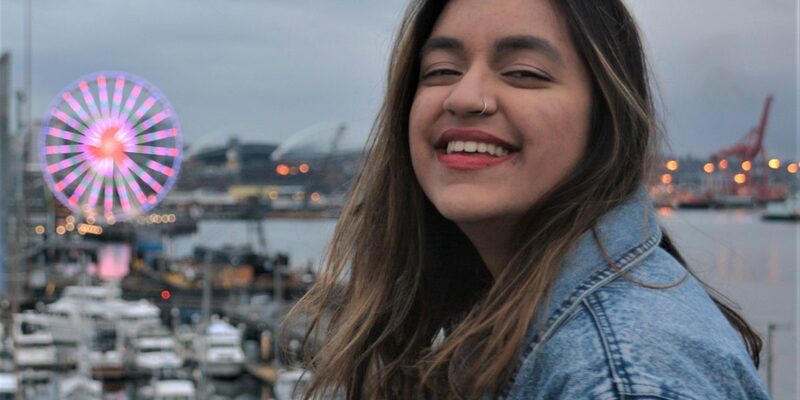 Aleenah Ansari is a Seattle-based writer who creates spaces for people to heal, learn, and tell their story. More than that, she is a story-listener who believes that she can learn from everyone, which she has done through feature writing that focuses on empowering diverse communities, work as a writing tutor, and internships at Microsoft as a UX writer and content creator. Although she’s going on to work at Microsoft after graduating this spring, she feels the most whole when she’s writing love letters, discovering new murals, and sampling seasonal flavors of ice cream at Salt & Straw. She can be reached at aansari@uw.edu.